In rotisserie baseball, there comes a time when you have to cut someone that you thought would be a key to your squad. It is critical to be correct when recognizing the difference between a player who will bounce back and a got's-to-go situation, which brings us to Chris B. Young. As with any important decision, it can be prudent to make a list of pros and cons. This is an informal brainstorm, and nothing is too ridiculous to be left out. Steve Stone raved about Chris Young when he was a minor league in the White Sox farm system. Steve Stone. He has a rare combination of power & speed and does not turn 26 until September. 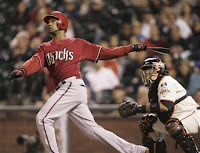 Slow start and strong 2nd Half last season: In 94 games before the all-star break, he had a .296 OBP, 13 HR's and 5 steals. 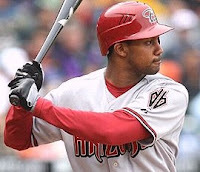 In just 66 games after the break, he hit 9 HR's and 9 SB's, with a .343 OBP. The D'backs just fired their manager and hitting coach, so a new approach may help. In 368 career Major League games, he has 350 strike outs. All of our bench hitters, besides Matt Wieters, are outfielders. We could use some more versatility. I'm not even in a batting average league. I'm in an OBP league, and maybe Young will never get a solid OBP. Maybe he's Jeff Francoeur. After taking a closer look at their numbers, I'm just not sure. Francoeur had a worse minor league OBP and better major league OBP. So, maybe this means Young can get better. Every competitive roto team should be able to carry a guy who's hurting you in OBP or Batting Average, if he can get some of the other counting numbers: R, HR, RBI, SB. It looks like my team has two guys that are really bringing us down in OBP, and they haven't been powerful enough at the plate or productive enough on the base paths to pay off... yet. We have Chris Young and Alexei Ramirez, who recently was benched for a few days to clear his head. I think we are going to let it roll with these guys a bit longer. I'm not so concerned that Alexei is going to be a long term problem, but this Chris Young guy really needs to get it together. Buster Olney mentioned he could be sent to the minors. He had a triple two nights ago and had another hit and a walk last night, so I'm hoping he snaps out of it soon. Does anyone else out there have guys who they thought would be steady contributors and are currently on thin ice?